Schlage deadbolts safeguard your home and family with superior protection against attack by crowbar, hammer, wrench, saw, lock pick and kick-in. With that kind of security, you can spend less time comparing brands and more time deciding on a style and finish. Follow the installation instructions below to install your deadbolt in 5 minutes! Cross Bore: 2-1/8" or 1-1/2"
Snap and Stay(tm) design makes installation easy and permanent. ANSI Grade 1: Professional grade security. The B60 uses the biggest bolt available. 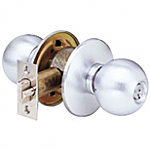 Adjustable 2-3/4" or 2-3/8" backset fits most standard doors. 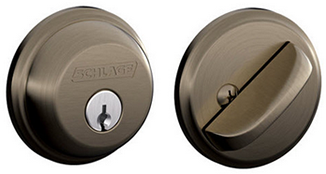 Schlage's quality finishes offer lasting beauty. The B60 features a lifetime mechanical guarantee. 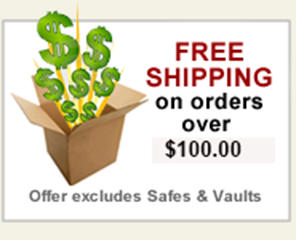 There is also a lifetime finish guarantee on all products with a Lifetime finish. Strike Plates (Part 10-116): Supplied with a Round Strike only with Dimensions of 2-1/4" x 1-5/8"